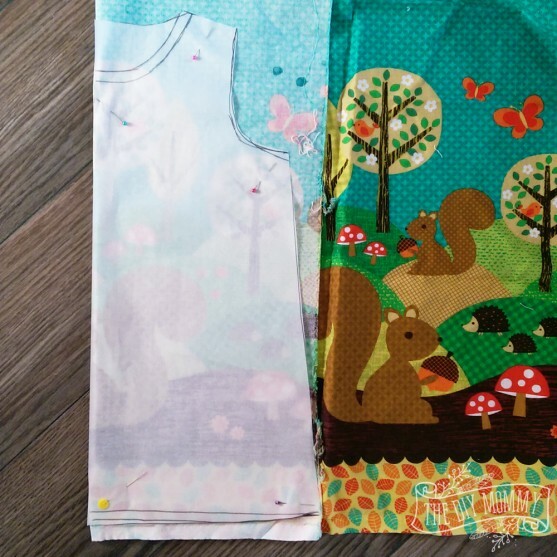 Fellow seamstresses: do you ever buy fabric just because it’s adorable? 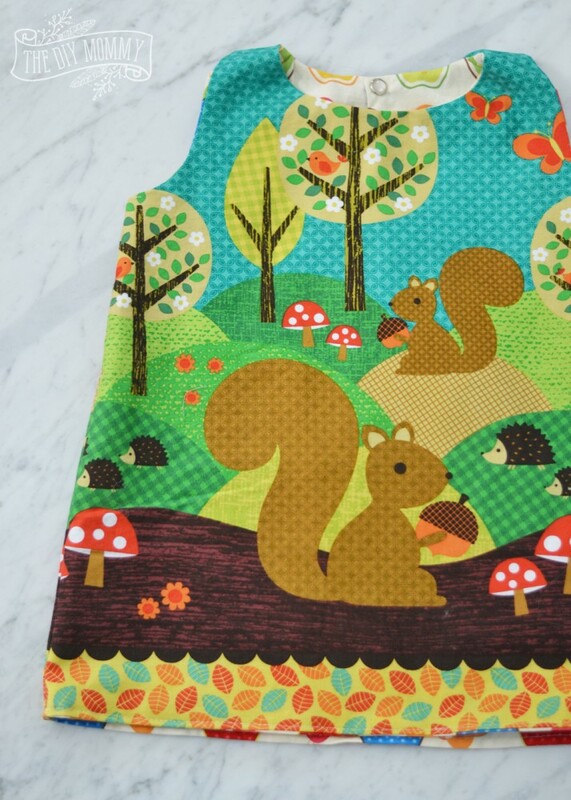 You don’t know what you’ll make from it, but it’s too hard to pass up because it’s so darn cute? I used to do that all the time. 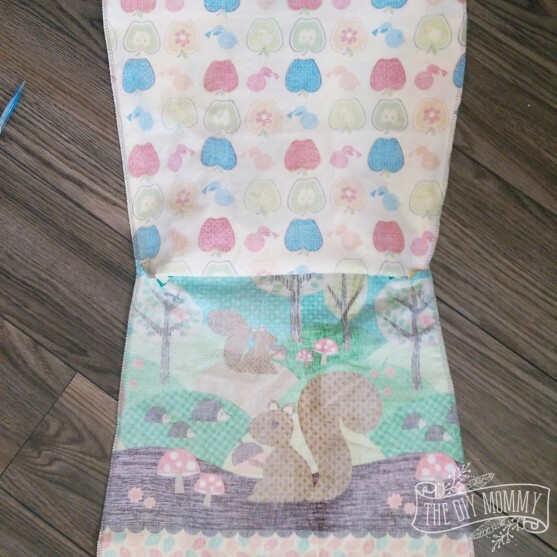 That was the case with this super -sweet woodland themed cotton fabric I’ve had in my stash for a couple of years now – I knew I loved it, but I was waiting to come up with just the right project for it! 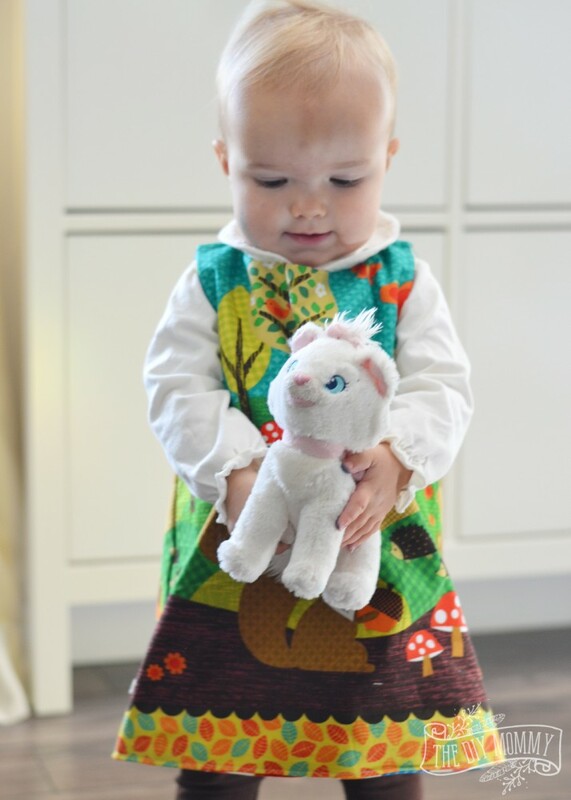 Finally, I decided this Fall that I had to sew a little jumper dress for Baby B. That’s when I quickly drafted this pattern and decided to make the dress even more fun by making it fully reversible! 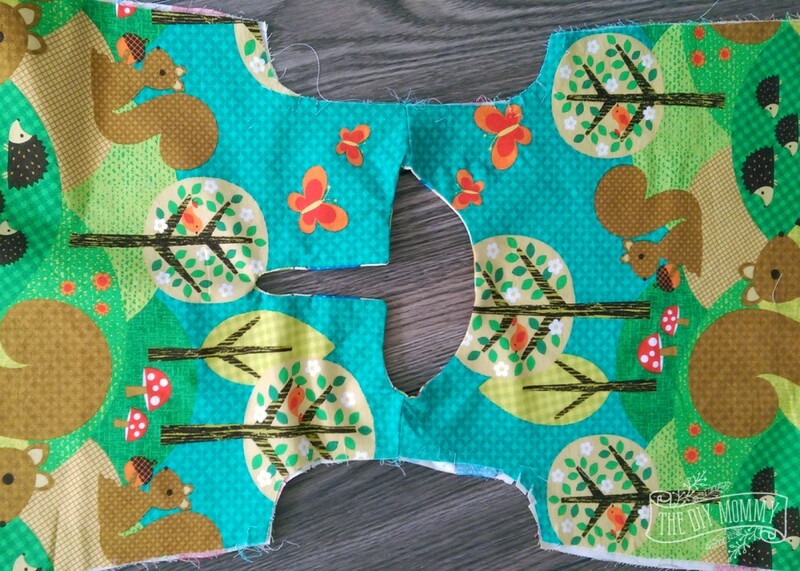 Here’s how I made a reversible baby jumper for Baby B and how you can make one too (I’ve included the pattern I drafted for Baby B in size 24 months for you to download for free)! Gah! Isn’t she the sweetest?! I can hardly believe that she’s over a year and a half old now. I can still remember how I felt when we found out we were having Baby 3. I think this jumper looks so adorable on her. It’s great in the Fall and the winter over a long-sleeved bodysuit, and it would be equally as cute as a dress in the summer. 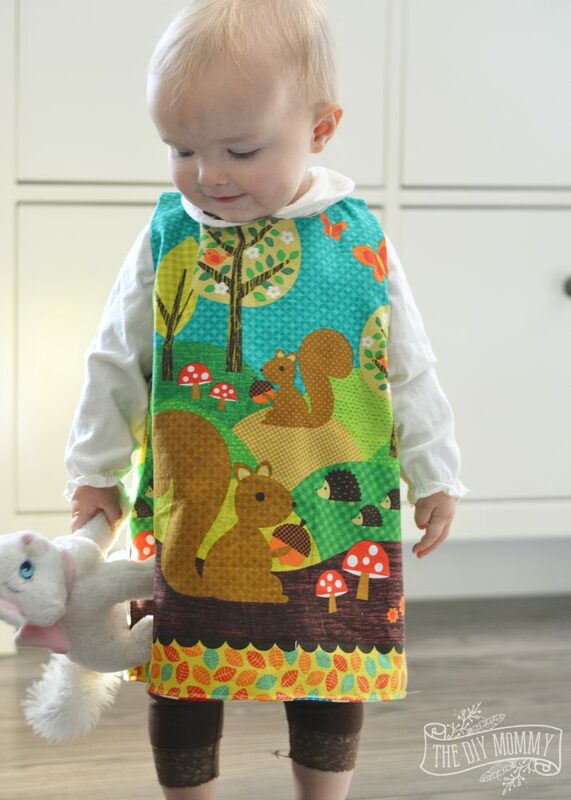 Plus it’s fully reversible! I also had this apple fabric in my stash that I wanted to use up, and I’m loving how it looks on the reverse of this jumper. 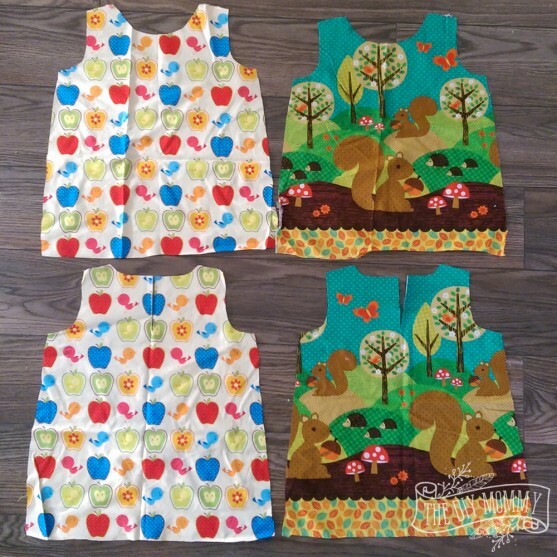 Here’s how to make your own reversible baby jumper or dress. Cut out your dress pattern. If you also want to make a jumper in a 24 month size, feel free to download my free baby jumper pattern by clicking here for the first piece, here for the 2nd, and here for the 3rd. 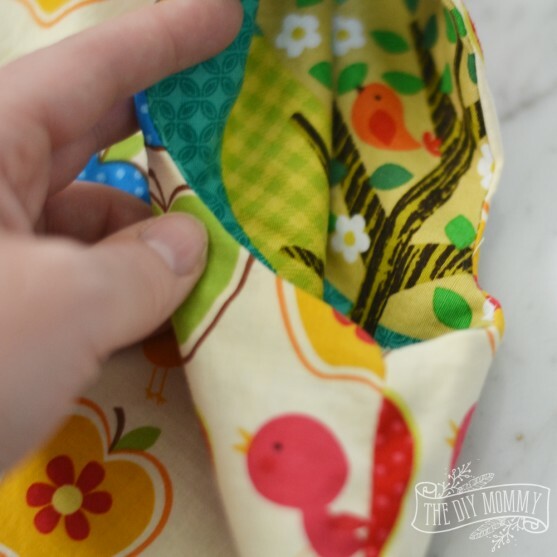 Fold your fabric in half, ensuring that it’s the right way up if it has a one-way pattern, and then cut a back and a front out of each of the fabrics. Cut a slit that’s about 4 inches long in the center back of the back dress piece as shown above. Sew the dress fronts & backs together at the shoulder seams as shown above. My pattern uses a 1/2″ seam allowance. 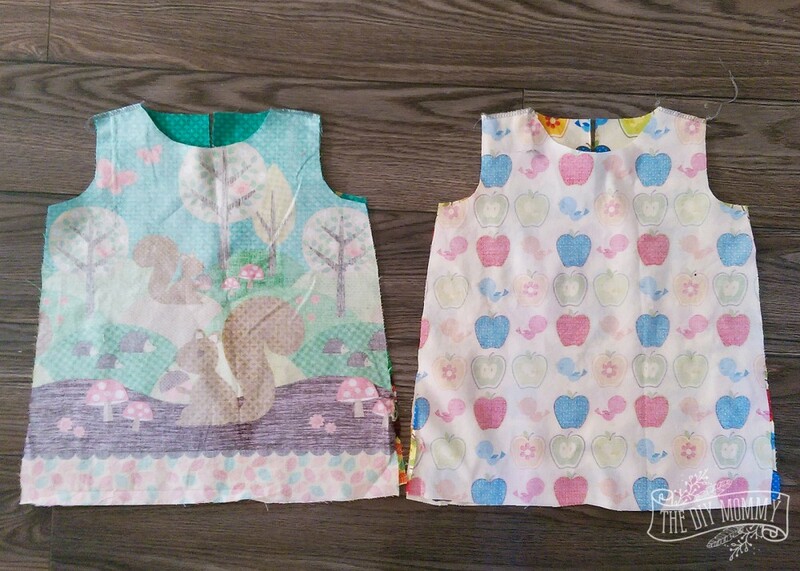 Next, place one of the dresses inside-out, and place the lining and dress pieces right-sides together. Pin and sew around the neckline and back opening as shown. Cut small slits around the curves and at the bottom of the back slit as shown. Turn the dress right-side-out and press the neck & back opening. Now, make a fabric “sandwich”. 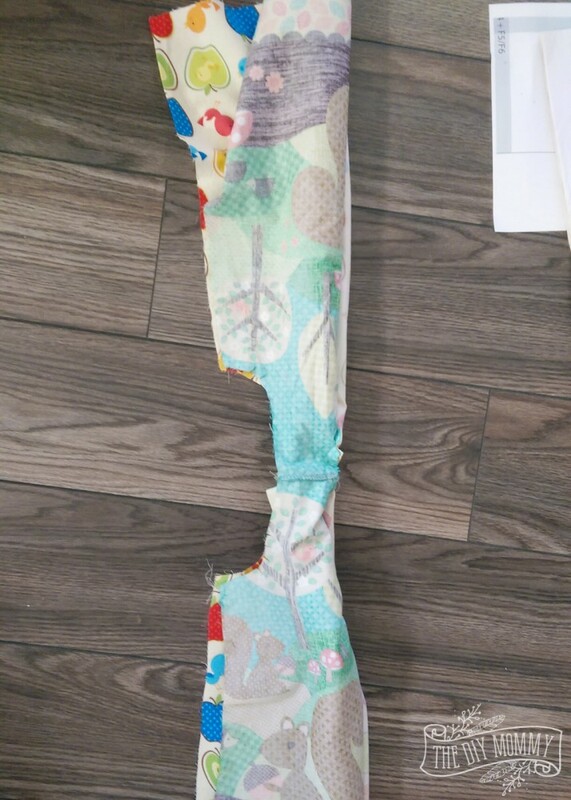 Flip the main fabric to the right. 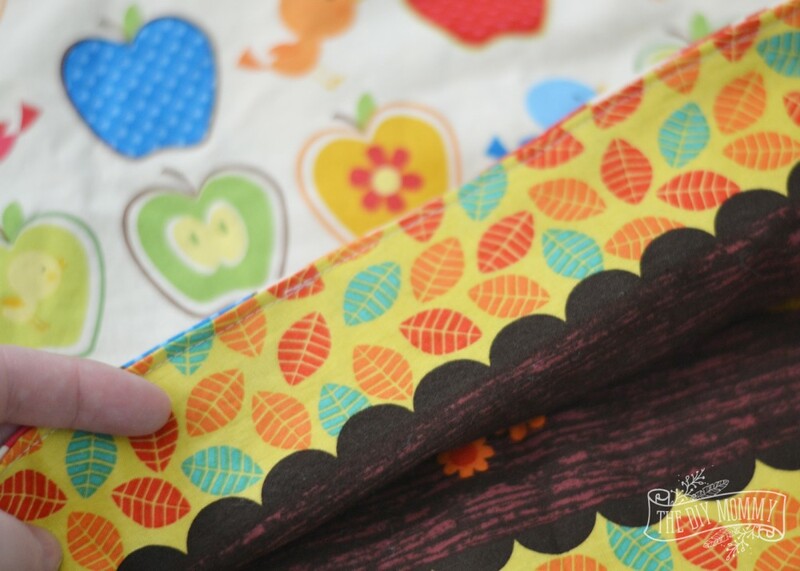 Pull the lining (the apples fabric in this case) from under and pull it to the right. Now line up the armholes, matching the shoulder seams. Pin and sew. If you’re confused by this method, this blogger does an excellent job (with more photos!) of explaining it. Look at how lovely the fully lined dress is! Turn the dress right-side-out through the shoulders. Open it up so that the same fabrics are aligned along the side seams, and sew the side seams shut. 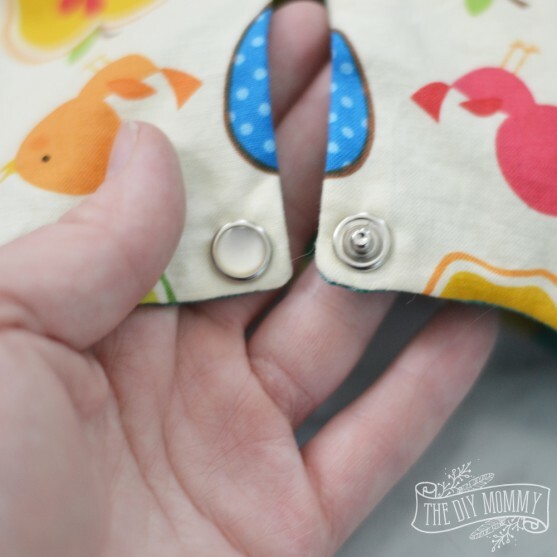 Flip it to the right side again and press the hem inwards about 1″ on both fabrics. Pin and sew a stitch about 1/4″ from the edge. Install a snap at the top of the back opening. Isn’t this a sweet little outfit? And it’s such a versatile piece! 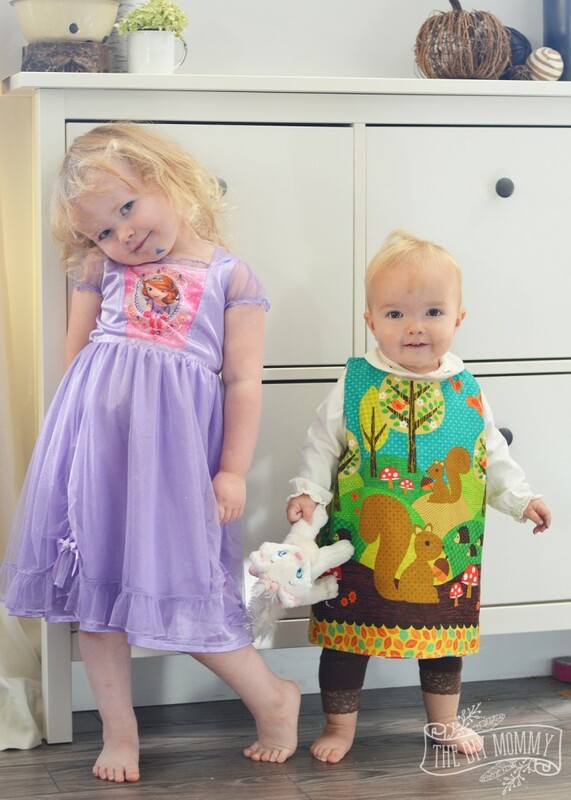 Happy sewing (and happy posing)! 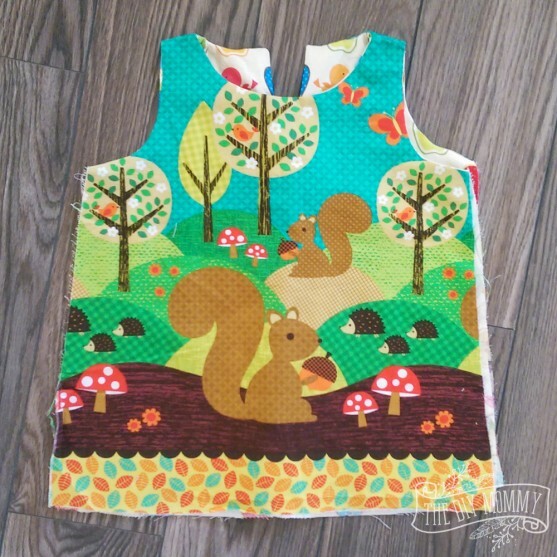 Thanks so much for the pattern, looks easy even though I never done reversible, I will try it. Thanks so much. Thank you, Christina, for this idea and pattern! Although I have been sewing for over 50 years, I have never made anything reversible, and after messing up one jumper, I went back to your instructions and the link you included, and the ‘sandwich’ concept clicked!! I completed one jumper and I’m working on my second jumper one now!! I cannot wait to try them on my 18 month old grand daughter!! Thanks again! And by the way, your baby model is just adorable!!! 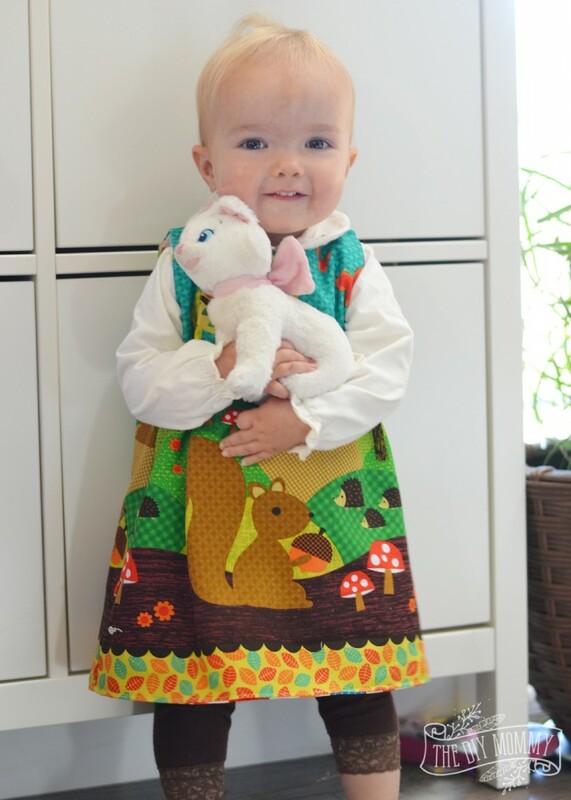 We are so happy that you were able to get the jumper sewn for your granddaughter. Have a great Holiday!! Hi Cristina! Thank you for sharing with us this brilliant idea. 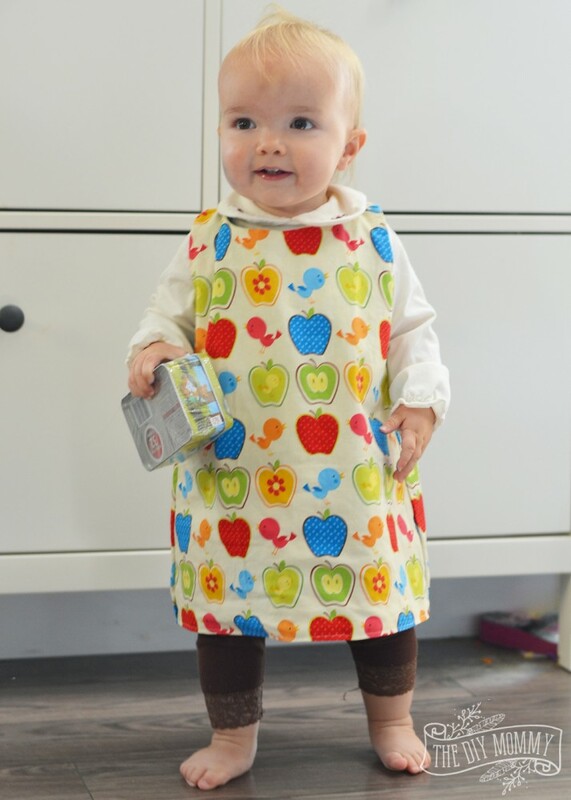 Baby B is so adorable-looking on that jumper dress. 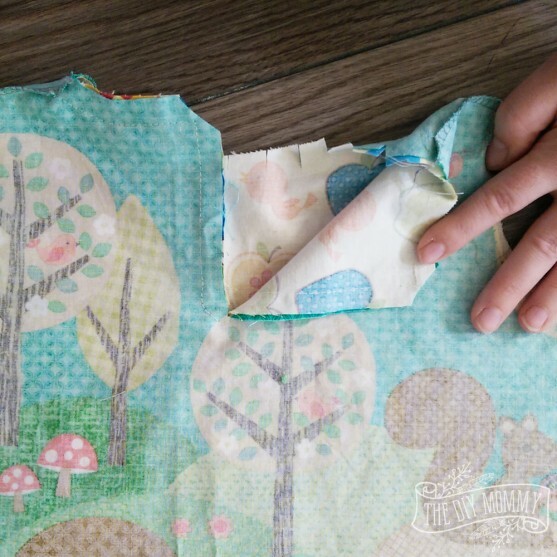 I have plenty of cotton fabric in my stash as well and this project would repurpose them. I am not a pro in sewing and seaming but the pattern included in your tutorial will really help me. Your article is really awesome Christina.I learned many of thing from this article.But can you please tell me what age baby can use these jumper?